On December 9, 1864, 150 years ago today, the main purpose of Warren’s expedition to Hicksford continued: destroying the Weldon Railroad. This day’s target was the section of road from Jarratt’s Station south to Hicksford. As the infantry moved south wrecking the railroad, Gregg’s cavalry moved south in advance, trying to push aside any Confederate opposition. He faced little in the way of Confederate resistance until he reached Three Creek around 10 a.m. There he found Confederate about 200 Rebel cavalry supported by a howitzer barring the way, the railroad bridge on fire. The 10th New York Cavalry was sent across one remaining timber of the Halifax Road bridge, and managed to force the Confederate force to retreat. While Warren’s infantry was destroying the Weldon Railroad south of Jarratt’s Station and Gregg was pushing south to Three Creek, Wade Hampton was preparing a warm reception for any Yankees who managed to reach the Meherrin River and Belfield/Hicksford. Hampton had reached Hicksford early on the morning of December 9, bringing more of Butler and Rooney Lee’s cavalry divisions with him to reinforce the brigades of Waring and Barringer and the more permanent infantry garrison there. The town of Belfield was just north of the Meherrin River, with Hicksford to the south. Hampton left most of his forces in three redoubts behind the Meherrin River in Hicksford. But he also sent the 5th North Carolina Cavalry across the river into Belfield to prop up the reserve infantry forces stationed there. As Warren’s force slowly approached Belfield and Hicksford, A. P. Hill’s large pursuing force of infantry started about four miles south of Dinwiddie Court House on the morning of the 8th. He pushed his men south on the Dinwiddie Court House road as fast as possible, eventually crossing the Nottoway River on the twin bridges near Wyatt’s Mill. After reaching a crossroads just to the south, Hill weighed his options. Mahone wanted to split the infantry in half, with Hill moving to Warren’s support at Hicksford and Mahone striking due east to Jarratt’s Station on the Weldon Railroad, hoping to hit the Federals in the flank and cut them in two. Hill decided against this aggressive course, instead continuing to move southeast in the direction of Hicksford. The Third Corps commander and his infantry ended the day without having done any fighting, bivouacking at a point six miles southwest of Jarratt’s Station and six miles northeast of Belfield. Grant had Meade busy back at Petersburg continuing to look for weak spots in Lee’s lines. Meade again sent a force to probe the Confederate defenses along Hatcher’s Run near the Vaughan Road, but this time it was much larger. Rather than a bit of cavalry, Meade this time sent three fourths of Miles Division from the Second Corps. I covered this December 9-10 reconnaissance to Hatcher’s Run in another post today. The Confederates defending Belfield and Hicksford didn’t have long to wait before Gregg’s lead elements showed up around 3 p.m. Gregg probed with several feeble attacks, but at no point was a serious effort made to force a crossing. 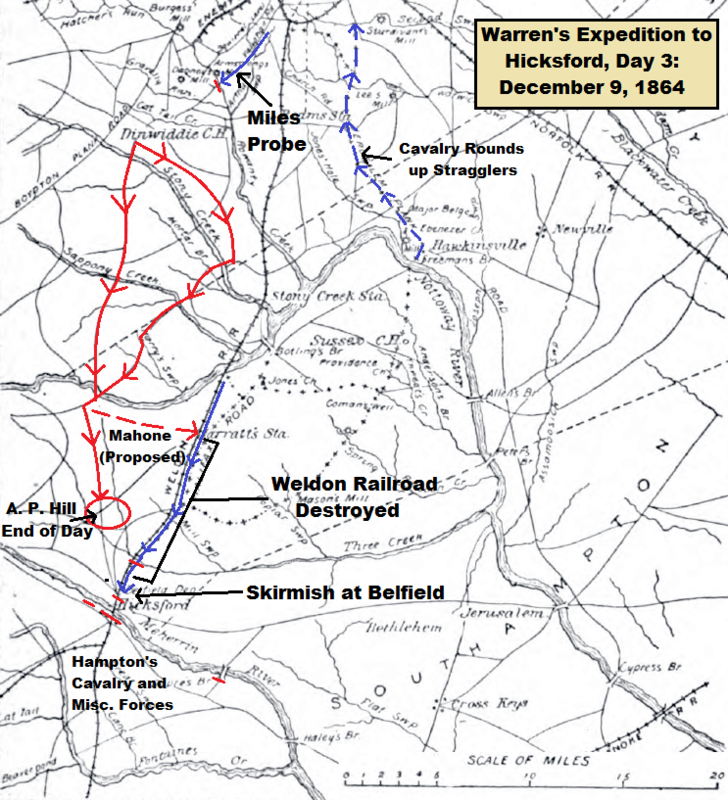 As the cavalry probed at the Confederates in Belfield, the Union infantry continued to wreck railroad, ultimately tearing up the track almost all the way to Hicksford, sixteen to seventeen miles in all over the course of the raid. The Federals found abundant Apple Brandy, or “Applejack,” in houses all along the route. Many Union soldiers got completely drunk, and some behaved very badly as a result. Around this time Warren learned that Confederate infantry was on its way. He was also worried that bad weather might trap him well south of the Union lines with the Nottoway River as a major obstacle. These pieces of information combined with the fact that his infantry had accomplished the main goal of the operation led him to the decision to reverse direction the following morning. The potential of winter weather was not an idle worry for Warren. The temperature plummeted as evening wore on, and sleet fell all night long. The Union soldiers who had tossed their overcoats carelessly aside early in this march would suffer greatly on the return trip. The Confederates, many of them barefoot, would have an even tougher time of it.